The logwood purple extract gave a good strong indigo-purple. My book told me that with alum mordant, the logwood purple is not very washfast, so I added iron sulphate to the pan. 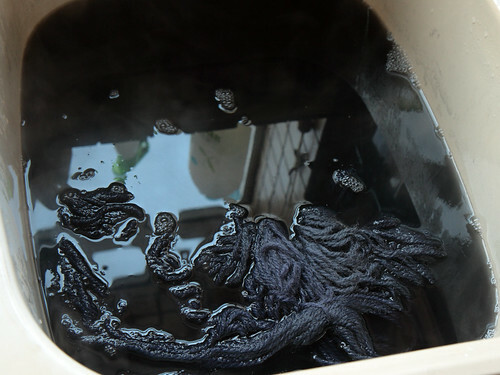 The dye bath was very dark, especially after the iron went in, but all the dye was absorbed after an hour of simmering. During rinsing most of it came back out again! However, it only took a couple of rinses to run clear so I’m confident it will stay this colour. I think it would look great mixed or overdyed with some lac or brazilwood. 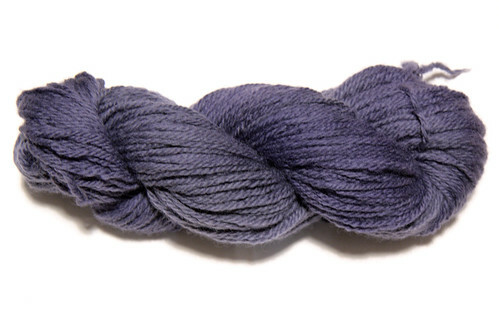 Logwood Purple rinsing – a bit scary! 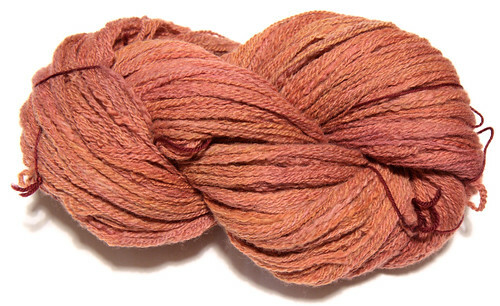 Remember that peachy-orange skein of handspun from my spinning update. Well now… it’s still orange, but I think it’s better than it was. I put it in a dyebath of lac, but it didn’t absorb much of it as it was unmordanted (I didn’t want to risk felting). I am still at a bit of a loss as to what to make with it. The current favourite is the Japanese Feather Scarf by Anne Hanson. I used the exhaust from the lac bath mixed with the exhaust from the logwood purple bath on another skein of superwash. It’s quite unusual and rather pretty I think. That logwood purple looks fantastic! Let’s hope the colour stays when washed again.